rebuilder86 had the most liked content! One thing ill add, concentrate on covering every possible piece of coper wire with heat shrink, or solder, or both. The humidity in the middle of the archipelago, mixed with the geology of magnetite (which turns into fine magnetic abbrasive ferrous rust particles in the air) makes it the worst place on earth for... Welll.... Anything. I can&#39;t make a set of 6x9s last more than a year. The dust gets in to the coils and kills em. Well papay u may have a 5k, but if it is, its either A. Got the wrong head or B. An incredibly rare flat top pistons 5k. What i was saying about pinging, was the missmatched head makes it drive exactly like u say, smooth and never pingng. Theres not enough compression for it to detonate (ping). So just open a spark plug and check the pistons with a torch. And hope to see no D dish. i think when parts break there, they just get something which fits, so be prepared for it to all be wrong. Its just such a common engine in philippinea that most of them have ben mucked around with. Hell, i can get most 4k parts at the local merkado. U been Chillin in panglao? My dads wife is from tagbilaran, i spend a lot of time there. I don&#39;t see any lugs under the cylinder head spark tube holes. Its a head for flat top pistons, so unless u have an amazing rare 5k with flat top pistons (as opposed to deep dish) the id say its a 4k of some variety. In fact that reminds me head to piston compatibility is the first thing id check. Open a spark plug and make sure all the pistons are flat tops. If u can see any dishes, then u have the wrong head. If so then u have been fooled the same way i was. Mine is missmatched and therefor economy is terrible and i can&#39;t make it ping (detonate) with any level of spark advance. Ive got mine set to a ridiculously advanced state as a temporary measure. Only in the philippines. Lol. I&#39;m in cebu and have an owner type jeep with 4k, and its got the 5k electronic dizzy, maybe they got mine from urs and swapped my old in into urs?? :p If u look on olx there is a great cheap electronic dizzy for sale in manila. Cheap as. 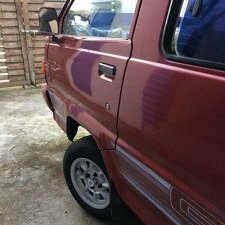 https://www.olx.ph/item/toyota-4k-5k-liteace-fx-distributor-electronic-type-ID7O55W.html?h=7b3cf24ffe Combine that with a decent new coil, ill find the model of mine for yah, its available throughout the country. The original points type coil is a bit weak with the electronic dizzy so be sure to do this. Mine is fuelmiser cc215. Mine has a voltage regulator, but it is simply there as a sort of, over complicated harness connector and does nothing but simply connect the alternator field wire to the main bus when the key is in lol. The alt has built in regulator so all the wires from the VR just go to the abyss. Must be a common thing in the philippines. Also, in cebu, in the middle of the city, there are a few absolute paradise toyota k series junk yards. Like shelves atacked roof high with cylinder heads, blocks, old pistons, crankshafts, dizzys, u name it. Surely manila has something similar? What RPM to drive when facing oil problem? just out of interest, parrot, you mention lack of gravity and no oil pump... Do u mean youd just fill the entire engine from sump plug to filler cap with oil haha. Or are you saying without gravity, the bearing journals clearances wouldn't empty? Or are you just simply stating that without gravity the oil would splash around everywhere and wouldn't settle in the sump? Thats an interesting question now... I dunno, to replace fluid that is ejected out of the bearing journals??? Are u suggesting we should move to space? It probably makes more sense than staying here. Just managed to put the ring on the missus so well be outa here soon hopefully, so space could be an option. Banjo, yeh i felt guilty driving along the flat roads trying to be gentle on the engine, because being gentle meant coasting in 4th and not seeing anything on the gauge. Therefor it felt better to drop to 3rd and see something on the gauge, but then id think about the speed of the crankshaft and jump back to 4th haha. I couldnt make up my mind, hence this post. I kept thinking, i wonder what someone else would so. I wanted to start a discussion with those with mechanical minds, and hopefully not have it become an argument. TO THE INTERNET!!! My little poor old 4k is on its last legs until its rebuild which should happen beginning of next year. To keep oil pressure up while driving over the mountains, when it all gets hot, ive had to add an oil conditioner product which did exactly what it claimed to do. I put in 3 litres of new mineral 20W-50 and stuck in about 300 mls of this additive stuff. without the additive, my cheap gauge wasnt registering a thing driving up hills all the way to about 3500 rpm. After putting it in, i was getting some oil pressure back and that has got me by. It has got me wondering what peoples opinion is of driving with oil pressure problems. Pretend you were on mars, and in order to survive you had to make your 4k powered mars rover get you back to the base station 2000 km away. If you damage the engine you will be left to die. Would you feel better driving at higher RPMS and actually seeing some oil pressure, or would you take the mentality that lower rpms generate significantly less heat in the main bearings? I'm stuck on this. My thoughts: Lower rpm means more pressure on the bearing at any particular time compared to shifting up a gear (mechanical advantage) Lower RPM means cooler bearing and oil temps according to all engineering documents ive ever read Higher RPM give more oil pressure when a pump is failing or main bearings are beyond service specs I just don&#39;t know what is theoretically better for the engine, and would like to know if any of you have ever been in a similar situation and wondered what your driving habits were. banjo? U may struggle with that gasket issue. There are a few different styles. One is a left hand side accel pump hole, other is right hand side accel pump hole, and the other is a left side wiht one less bowl cover bolthole.